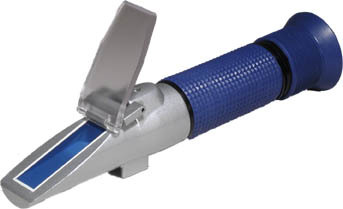 The ARS Equine Colostrum Refractometer is a portable instrument for analyzing mare colostrum quality. Only a few drops of colostrum are required and the entire test can be completed in less than a minute. The ARS Equine Colostrum Refractometer features automatic temperature compensation for enhanced accuracy over an operational range of 10°C - 30°C (50°F - 86°F). Knowing the colostrum quality of the mare, immediately after foaling, allows the owner and veterinarian to determine if additional high quality colostrum will be needed by the foal. The results from this test can also be used to identify suitable mares for colostrum banking.